As fall and winter settle in, don’t hesitate to try something new. Consider having hot pot be the centerpiece of your next dinner party. Although it has been unseasonably warm here in Maryland, over the weekend, it will finally feel like fall. When that chill creeps in, it puts you in the mood for soup. As fall and winter settle in, don’t hesitate to try something new. Consider having hot pot be the centerpiece of your next dinner party. Getting the ingredients and tools you need for hot pot might take a little planning. You need to figure out how many guests you’ll have at your dinner party, so you can be sure to have enough to go around. 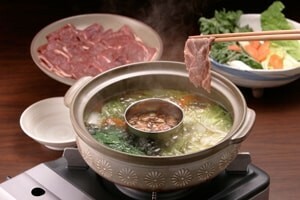 Then, you need to realize that this is not a quick meal – it can take several hours to enjoy a good hot pot experience. That said, you don’t need a truly authentic pot to have an enjoyable time either. If you have a fondue pot, that might be all you need. When it comes to preparing the hot pot, you need to gather different types of fillings. The meats, veggies, dipping sauces, and rice or noodles all come together to make something magical. Chicken, beef, and shrimp are some of the most common ingredients, along with seafood meatballs made from fish or squid. If you want the meat to cook more quickly, slice them as thin as possible, but if you want to include vegetables and tofu in your hot pot, cooking the meat ingredients first is the way to go since you can infuse the broth with the additional flavor the marinated meat. Every batch of soup needs a hearty broth. The broth in your hot pot is no exception. Chicken broth and veggie broth are the two most popular types, and you can get a yin-yang shaped pot, so you can fill one side of the pot with meat-based broth and one with vegetable broth to accommodate all of your guests. Make broth on the stove, so you can refill the pot when the broth in it runs low. Keep the broth simmering, so it’s always warm no matter how long you have been gathering around the table talking and laughing. Once everything is ready, it’s time to serve the hot pot. If you are using an electric pot, then make sure the cord isn’t in the way, so nobody trips over it or disconnects it by accident. Put the pot itself in the middle of the table so that everyone can get to it. Keep a soup ladle on hand and give everyone their own bowl and a set of chopsticks. This entry was posted on Friday, October 12th, 2018 at 11:22 am . You can follow any responses to this entry through the RSS 2.0 feed. Both comments and pings are currently closed.